This is an extremely easy entrée to make that uses only four ingredients, but has wonderful flavor by adding a single spice. The spice being used in this dish is not spicy, but will remind you of fall scents and flavors with hints of a “little something else”. Five spice seasoning is made up of ground star anise, fennel, cinnamon, cloves, ginger and pepper. Some brands may contain licorice root too. Ingredient amounts will serve one. Adjust ingredient amounts to accommodate the number of people serving. Thoroughly rinse the salmon filet and drain. Pour sesame oil into a small dish and brush it over the salmon, flesh side only. Sprinkle the salmon (flesh side only) with five spice seasoning and kosher salt. Preheat a grill to medium high heat and grill salmon flesh side down first for about 4 minutes. Flip salmon, cover and continue to cook until skin easily separates from the filet with a metal spatula. 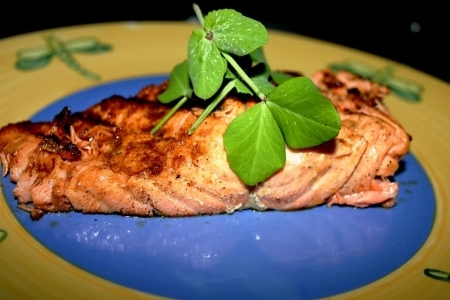 Cooking times will vary depending on your grill and the thickness of your salmon. or Asian Style Red Pepper and Sugar Snap Peas. Try Sapporo, Tsingtao, Brancott Vineyards Marlborough Sauvignon Blanc (New Zealand), Chateau St. Michelle Sauvignon Blanc (Columbia Valley) or Shades of Africa Sauvignon Blanc (Africa).